Have you ever needed to void a check in MAS90/200, but weren’t sure how to go about it? Have you tried to void a check but received unexpected results? Let me unveil the mystery of how to void a check in MAS90/200. First, it is important to understand that MAS90/200 has its own terminology for voiding checks, and it may be a little different than what you have been used to. I will give you some definitions. VOID check: To mark a check number as void. To illustrate, let’s take a simple example. Blank check stock is sitting on your desk. Your cup of coffee spills and ruins one of the checks. You want to mark it as void in MAS90/200. Here’s how you do it. Hmm. What does this mean? In MAS90/200 vernacular, reversing a check means to reverse the impact of having issued the check; i.e. 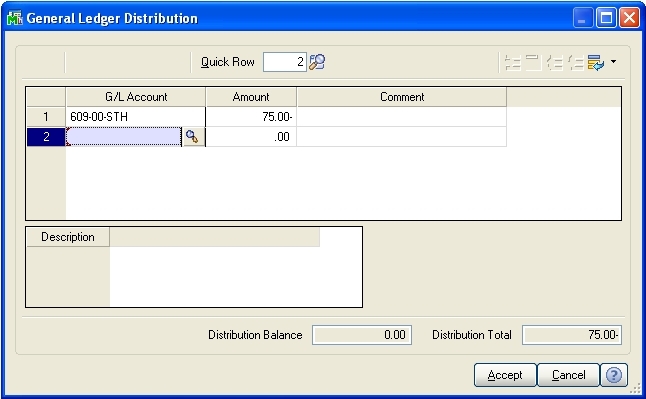 payment of the vendor’s invoice is reversed, and general ledger distributions are reversed. BE CAREFUL!! This may NOT be the same GL account number that was used to distribute the original vendor invoice to. You should look up what account(s) were used for the invoice and enter the same account(s) here. I’m going to more so disregard your post and ask a question about the check history document you have shown. Regarding the first entry on this list, for Bike Co with no check number or date and a negative amount. Do you know what that is? I have similar entries on my check history report. I looked up the invoices and they are from years ago. Is there any way to get rid of these entries? Hi, Claire. Basically, these records have become corrupted, as they are no longer associated with the invoices that they paid. This could have happened due to various reasons. The bad news is that there is no way to remove them through any task or utility in MAS90. The good news is that someone with knowledge of MAS90′s data table structures and skill with the Data File Display and Maintenance utility can either edit the records to get them associated back with their invoices, or remove the records completely. Depending on the dates of your orphaned checks, there could be tax or audit implications from removing the records. I usually check with a client’s accountant or CPA for approval. hi I voided a check on system date 12/31/2011. the actual date of the check was 2/2/2012 and I deleted the invoice as well. the invoice was dated 12/31/2011 thus the error.How can i reverse the incorrect void check in 2011& will this impact my general ledger for year 2011? please help. Hi, Celia. No, but why would you need to? The check is voided, and should be so, yes? The invoice doesn’t have a balance owing, which is correct, yes? If both things are true, then the only thing that is actually incorrect is which month the GL distributions are posted to. The conventional wisdom in a case like this is to enter a GL Journal Entry to move the amounts to the right months. Hi, here is what happened, I was printing a single check, I put in the check before the initial reports stopped printing and I printed a report on my check. If I VOID the check #, will it leave the payment as made? We also have manual checks. I wrote one out as it was an emergency payment. If I reverse a manual check in Mas90 it reverses the transaction in the check register as the original date of the check. However it appears in my general on the actual date I reversed the transaction. Is there a way to manage this so that the check reverses in bank reconciliation for the current date so that it will agree with with the general ledger without having to enter a journal entry? I entered the wrong check date an ap check and have reconciled the bank account. Can I change the date? Cheryl, I’m sorry I wasn’t able to respond sooner. We had some technical difficulties which have been resolved. I am replying now, in case you still need an answer. Yes, if you mark a check # as VOID, and do nothing else, it leaves the payment as made. If you hand-wrote another check to get the payment done, then to make the check history reflect correct check numbers, you can REVERSE the first check number, say Yes to recall original invoices paid, print the register, update, and then record the handwritten check and select those same invoices. Lisa, I’m sorry I wasn’t able to respond sooner. We had some technical difficulties which have been resolved. I am replying now, in case you still need an answer. MAS90 will always reverse a check with its original date. There is nothing that can be done about that. However, when you go to update the Check Register, you may change the Posting Date backwards, provided that AP period is still open. This will create a distribution to the GL with the posting date you give it. Otherwise, you’ll have to keep doing journal entries. Rick, if it is very important that you change the date of the check in MAS90, yes you can. I phrase my answer this way because I would first decide what the consequences are of not changing it. If it has minimal impact on accounting/reports/audit trails, then I would leave it alone. But, if you must, then first Reverse the check and recall the invoice paid, print the register, and update. Then enter the same check number again, (answer No this time to “is this a reversal”) and enter all the information with correct date, etc., print the register, and update. This will put two instances of this check number into B/R, one positive and one negative, and you may simply clear them on the the next reconciliation. Hello! I have a month old invoice that I thought I deleted still in my system. Every time I do my Accounts Payable and update my register, the open invoice doesn’t show, but it prints out on my checks. This has caused me many headaches, and I don’t know how to get rid of it. I go into Check Maintenance and set the amount to 0.00, but it still has printed out as the original amount. I do not want this amount to be paid. Is there a way to delete this permanently? My MAS90 records indicate that this invoice is waiting to be paid. Is there a way around it if I can’t delete it? For example, if I subtract the amount from the current invoice amount I am paying, will it add on to my check later, thus finally canceling itself out? Please help!! Hi, Amy. So are you saying that the the amount of the invoice is zero in the invoices panel for the vendor? If the answer is yes, but the invoice keeps coming up to be paid when you select invoices to pay, then your data is corrupt and needs to be fixed. You should ask your Sage business partner for assistance. If you don’t have a business partner, we can help. Contact me directly by phone or email. Hi again Karen. If you do a Vendor Inquiry, it shows up that the invoice is written and waiting to be paid; the balance still shows. It was an invoice that I changed the total on about a month ago, and the difference between the totals is still waiting to be paid, as if I had an out of balance invoice. Is there anything I can do? Or is this going to remain in my system? Well, if the invoice still shows a balance due, and it really should be zero, then the best thing to do is to go into AP Invoice Data Entry, enter the vendor and the exact same invoice number. A window will pop up telling you that the invoice is already on file. You can click the Adjust button on that window, and it will bring the invoice into the data entry screen. 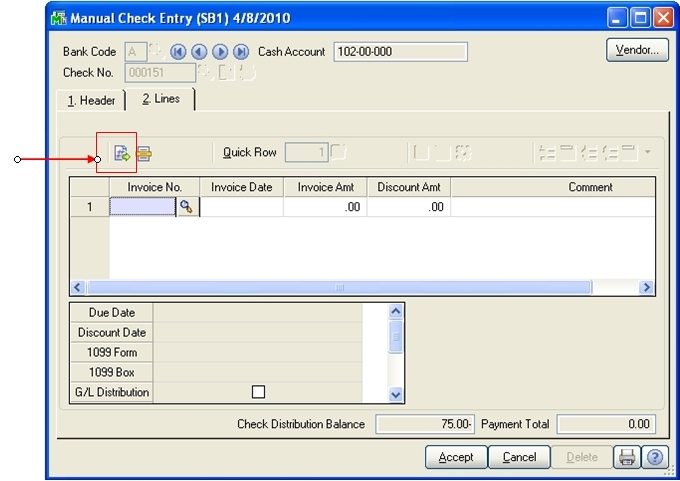 The current balance of the invoice will show at the bottom of the data entry screen. You may enter an adjustment amount as a NEGATIVE to bring the balance down to zero. Does this make sense? When I enter the Vendor and Invoice Number, it pops up and says “Invoice already being paid.” Is there a way to get into this specific invoice so I can cancel it out?? I’m thinking if I make a new invoice for this vendor it will add the outstanding balance to my check, thus finally removing itself from my system. Is this what I should do, or is there any other way to make the balance zero? Ooooh! You have *that* problem! There is a way to fix this with the utilities, and the method depends on the version of MAS90 that you are running. I’m going to email you. Please reply to my email and we will determine what to do. I’m trying to void a check that was written today. When I follow the procedures above it tells me that check number is voided. If you look in the history it isn’t voided. Although there was check with the same number voided back in 2010. In the Manual Check and Payment Entry window I can’t do a find on the particular check number I’m looking for. Is there anyway to void this new check that has the same number of one voided in the past? Mary, it completely depends on the version of MAS you are on. For instance, in version 4.40, re-entering a check number that has previously been voided causes this message to appear: “This check has been voided. 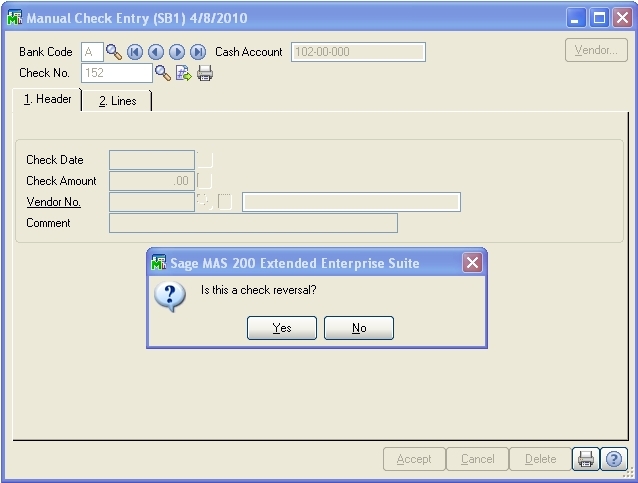 Do you want to reuse the check number?” If “Yes” is selected, MAS will allow another Void to be recorded for the check number. However, each version of the software behaves differently. Tell me your version, and I may be able to help. Very good. Then you should get the same message that I spoke of, and it should allow you to continue recording the void entry. If you are getting a different message, email me directly at kolane@microbusinesssystems.com, and let’s see if we can troubleshoot it further. Hi. lately I’ve been voiding old checks from prior months. I use the 3 step rule. Void, Reverse, and adjust. However, at the end of the month the accountants tell me there register is out of balance. How can I void an old check and have it posted to the prior month? Example: I have a june invoice and the month I am voiding in is November, I never change the invoice date or check date..so this ends up throwing the bank req out of balance. Please help me learn the correct way. 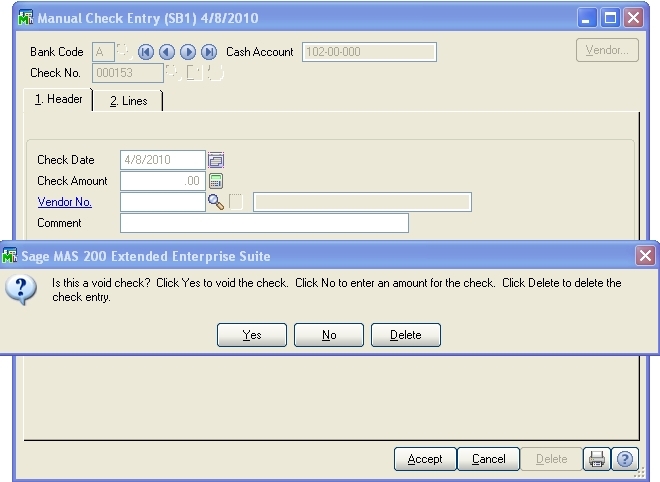 Is there anyway to void multiple checks at once? I have a batch of 25 checks that all need voided. Do I have to do them individually? If the check being reversed/voided has more than one invoice, can you recall just one of them and not the others? I have to reverse/void a check that only one of the invoices needs to be recalled. Hi, Jen. Excellent question! The “do you want to recall invoices” question is an all or nothing proposition. You either recall all of them, or none of them. But here’s the good news. Regardless of your answer, you can make the appropriate changes on the lines panel. If you recall them, then delete the invoices that don’t need to be recalled, and enter an extra adjusting line in their place. If you do not recall them, you can still enter the invoice number that should be recalled, and enter a negative amount for that invoice to bring it back. Then enter an extra adjusting line for the balance. Does this make sense? Hi, Laura. On the face of what you’ve told me, I’m not sure why the bank register would be out of balance. Assuming the check never cleared, it would still be on the bank rec, uncleared, and your reversal would bring the balance of an uncleared document to zero. Further investigation is needed. Ask the accountant to show you the problem. HI, I had a check that I wanted to void. I reversed (adjusted) the invoice before I voided the check. Thus causing a CR balance that appears in my cash requirements report. Can I use the void check process at this point to correct the mistake or do I need to complete a JE to remove the CR? JE DB Cash Account/CR A/P would be my thought. What do you suggest. Thank you for your consideration! Hi, Alicia. The problem is that the invoice now shows a credit balance. To correct everything, I would adjust the invoice back to zero, then reverse the check. I reversed the check and it still shows in the invoice payment selection register, how do I take it out of there? If this paticular invoice is not needed anymore. Hi, Annie. You need to adjust the balance of the invoice down to zero. 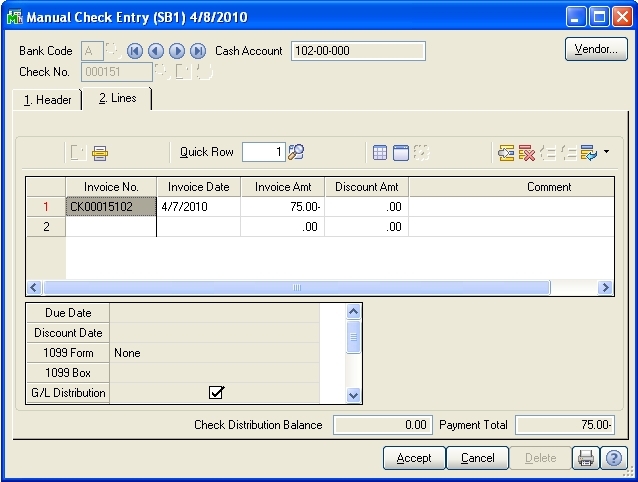 Use A/P Invoice Data Entry, enter the vendor and invoice number. You will receive a message that says this invoice is already on file. One of the options on that message window is an ‘Adjust’ button. Click it. The invoice will be retrieved into the data entry window. Enter a negative adjustment amount. Distribute to the correct GL account, print the register, and update. Do u know how to fix the continuous check number? Every time i print a check i have to key in the check number. The next check number comes from Bank Code Maintenance. Go there to change the next correct starting number. Hello. I was in the process of printing a check but input the wrong starting number (ie. 115388). The wrong check number is printed on my pre-printed check (ie. 115449). I didnt update my register so I went back into the check printing option and input the correct check number (115449) and checked off the “print checks already printed”. Then I printed on a blank sheet of paper. When i was about to update my register I reviewed my check register to make sure it doesnt show the incorrect check number (115388). What it shows is a range from the wrong check number to the correct number as VOID (115388-115448). Then a second entry with the correct number number (115449) as okay. I still didnt update and wanted to know if it will void the sequence (115388-115448)if i update. If it does what can I do to fix it before I update so it shows only the correct check number (115449)? You don’t have a choice. It may mark the checks in the range as void. However, it won’t affect the original data with those check numbers. I just had a similar issue as Krista but I made the mistake and did not check carefully before I updated. Well I run some checks ending 0452-0461 they all came out ok but it was not updating so I went back to the beginning and reprint them on white paper and as press print, I realized I need to check the check # at that point they started printing on the wrong number so I did not update but run them again on white paper then check the # and I read 0452 but it was 0462 and still did not see the mistake then went ahead updated so when I went to do the next batch of checks I was off. Then I check my check register and yes the first checks that I printed were void but all those went out and in my system show 0462-0471. I can’t change what I already sent our vendors but how can I get the void check with each correct vendor in the system as those went out. Oh confusing… Can someone help me out. Look to see if you have a “Remove Voided Checks” task on your AP / Utilities menu. Whether or not you have it depends on the version of Sage 100 (MAS90) that you have. If you do, select it. Then enter the bank code that the checks were written from, and enter the range of checks. All that this will do is to remove the “void” notation from the checks. It does not remove the check itself. It does not impact your accounting data. If you do not, there’s nothing you can do. Let me restate, however, that it is only a notation on the check number, with no impact on the accounting system. Confusing when you look at it on the check history report, yes. We voided a check in MAS90 without having the check in hand. The check then went through the bank. Is there a way to remove the void on this check? I printed a bunch of checks with a future date on them. I need to reprint using today’s date. I have already updated. Can I reverse the whole batch or do I have to reverse them individually? I am new to MAS 90 so this may be a rather dumb question. I have done some check reversals so I am familiar with that, but I have also just been “voiding” checks and leaving it at that. If I just void the check this does not re-distribute the cash does it? If I go into invoice data entry and put in vendor and invoice number and choose adjust, it is already showing a zero dollar value. Is this where I need to change the “zero” value and put in the negative amount of the original check? I tried using discount for the first time and my entries are coming out incorrect because I overpaid. Now I am trying to use option 3 of voiding an incorrect check. However, I’m stuck because it’s unclear if I should deduct the money I overcharged or if I adjust after I’ve posted the voided check. I have reversed a check, and reissued it. I see in my general ledger that the reversal does in fact debit cash and credit AP. But it does not reverse the initial expense. So after the reissue, I have double to expense on my books, and still have the AP open. How do I also reverse that initial debit to expense and credit out of AP? Does that have to be a manual journal entry? Hi. It sounds like you selected to recall the invoice during the reversal. That would have put the invoice back into open AP. To take it out, go into AP Invoice Data Entry, put in the vendor and the same invoice number, and then click the Adjust button. Enter a negative adjustment amount to bring the invoice balance down to zero. I ran a batch of checks (68) today 4/28/16 – the checks were dated 5/1/16, as the controller wanted them post dated. When I went to update I forgot to change the date of the update to 5/1/16. She was very upset to say the least. Is there any way to recall back that posted update and use 5/1/16 instead of 4/28/16 without voiding every check? Hi, Debra. Unfortunately, no. Voiding all of them, running the checks again (to plain paper), and updating with the correct posting date is the only way to resolve it. Good luck! We voided a check in MAS that later cleared the bank. Is there a way to remove the void on this check? Hi, Jill. It depends on what version of MAS you’re running. Look to see whether you have a folder/menu in A/P called “Utilities”, and if there is a task called “Remove Voided Checks”. If so, you can run it for a range of check numbers. All that it does is to remove those entries in check history that have “void” next to the check number. If you don’t have this task in your MAS system, the only thing that can be done is to go through Data File Display and Maintenance, find the record and delete it. This is a scary option though, so be careful! 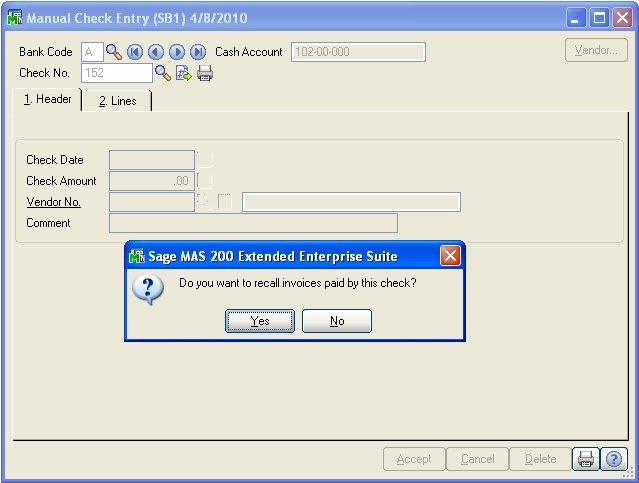 How do i reissue a check with the same invoice in SAGE 100? Do I do the reversal and recall invoices and then run the manual check register and then use the same invoice number to reissue? Yes, that’s correct. Once the invoice has been recalled and the manual check register has been updated, you may select that same invoice for payment again. I forgot to mention that this is on MAS90 v4.3, if that makes a difference. Thanks. Hi, Jim. Has the check register been updated? I just tried to preview the check register for the date in question and I received the message: Check Data Entry File is Empty. So, the check register was either cleared or updated. Run the check history report to confirm the range of check numbers that were updated. If there were, in fact, 200 checks updated, you will need to go through manual check entry and reverse them one at a time. Then you can print checks again, changing the starting check number to the correct next number. If they were cleared and not updated, you don’t have a problem. Karen, I just ran the check history report and they are in fact out there. (All 208 of them.) We only wanted to produce 4 checks. I am not sure what he entered. I ran the Check History Report. I guess that we can use that to enter my manual checks. Could you give me a quick step by step run down of how he needs to do the reversal transaction so that he doesn’t create more problems. (I am somewhat of a novice at this myself as well.) Thank you for all of your help. Just follow the instructions in my blog post for How to Void a Check, the section starting with answering yes to Is This a Check Reversal? It’s very straightforward. You just have to repeat it 208 times. Thanks!!! We’ll be very busy. I’m using Sage 100ERP. I wrote a check and updated and used the wrong Vendor. I did not send the check. I know I need to do a check reversal. My question is about the next prompt, “Do you want to recall invoices paid by this check”. my goal is for that invoice to disappear. I want to create a new invoice entry for the correct vendor. What do I do? Hi, Julie. Answer No to the recall prompt. You will then need to select a GL account to offset the invoice. Use the GL account(s) that the invoice was originally posted with and that takes care of the GL account balances. Then there won’t be an outstanding invoice on the wrong vendor’s account and you may proceed to enter the right invoice for the right vendor. This is a continuation on my question from above. Check the posting date for the reversals. It’s likely that it updated to a different period. I have accidentally voided a series of checks in MAS90 and am trying to unvoid them. do you have any suggestions? Hi, John. Look in Accounts Payable and see if you have a menu/folder called “Utilities”. If so, look for a task called “Remove Voided Checks”. This task clears the void status from a range of checks. If your version of the software doesn’t have this task, then you’re out of luck. However, in either case, you can reuse the same check numbers again. I accidentally deleted a $0.00 check in “Manual Check and Payment Entry”. The check should have been voided properly and not deleted. Any tips? I need to update Manual Check register today 3/14/18 but as of now, have not yet updated. Hi, Kevin. I’m making some assumptions about what has happened up to this point. You should be able to go into Manual Check and Payment Entry, enter the same check number, leave the check amount as zero, click Accept, and you will receive a prompt asking whether it’s a void check. Answer Yes and continue. Karen at MBS has saved us a major amount of time and money. She performed our accounting system upgrade remotely around our schedules so that we had minimal downtime. And she makes suggestions that really help us. If you want help with your system, but you don't know who to trust, I suggest you call Karen.